Taking advantage of the season and using the opportunity to promote diversity, the Southern Illinois University Edwardsville School of Pharmacy (SOP) celebrated various cultural traditions at its annual SOP Thanksgiving Potluck on Tuesday, Nov. 14. The event was hosted by the Student National Pharmaceutical Association (SNPhA) and the SOP Diversity and Inclusion Committee. Lined on several tables were crockpots and containers of cuisine that included Italian, Polish, Japanese, Lebanese, Bulgarian and American dishes. More than 100 SOP students, staff and faculty gathered for a time of goodwill, cultural appreciation and food. 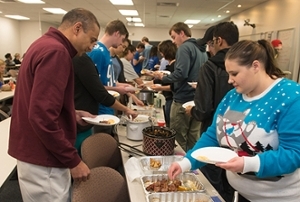 “The Thanksgiving potluck and the presentation of different cultural customs were a wonderful way for the School of Pharmacy to celebrate our diversity and value our differences,” said SOP Dean Gireesh Gupchup, PhD. The culinary festivities also included a time of testimonials from several faculty, staff and students, explaining various cultural approaches to the holidays and food. Jingyang Fan, PharmD, clinical associate professor, talked about some of the traditions, activities and dishes surrounding China’s Mid-Autumn Festival and the Chinese New Year. Misty Gonzalez, PharmD, clinical associate professor, gave a presentation on Guatemalan culture. 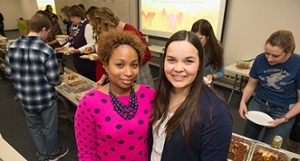 Helping to coordinate this year’s School of Pharmacy Thanksgiving Potluck with an emphasis on diversity are (left to right): Lakesha Butler, PharmD, clinical associate professor in the Department of Pharmacy Practice, chair of the SOP Diversity and Inclusion Committee and SNPhA faculty advisor, and Hannah Seeger, SNPhA president and third-year pharmacy student. Students line up to sample a diversity of food items at the SOP Thanksgiving Potluck. Considering his options is SOP Dean Gireesh Gupchup, PhD (on the left).